The sprites on the arcade are smaller, when comparing them to the area of the screen. So, double sized sprites are the ticket. Quad sprites are a little overboard. Not sure what version(s) of moon patrol you've looked at. I have several versions on my computer from various hacks(I think) There is a big difference with the music between some of them. Not sure if you are aware of this. I've attached a couple. I think what that is was the 5200 conversion with sound not being fixed correctly, Gremlins and Mario Bros were like that too. So.. how about a combination of your great buggy with the old tracks/wheels ?? Edited by TIX, Mon Sep 3, 2018 10:30 AM. LOL. That is a cartridge version of Moon Patrol. It doesn't set AUDCTL correctly, as the 1.79Mhz is default for SIO after loading it from disk. OMG is THAT why I have always thought MPs music was way off key ?? .....one other TERRINLE sounding game was Mario Brothers ....does this have the same flaw and if so, is there a fixed version ??? By the way, I totally agree that the game mechanics shouldnt be touched....it is a fine port gameplay-wise. I remember the DK version done here that changed the collision detection which totally screwed up the game for me...please dont go that route. Edited by Level42, Mon Sep 3, 2018 12:07 PM. Nah...they looked like 4 wheels to me and the arcade original has 6....well three that we can see)....I vote stick to try to be as close to arcade as possible. The "tank tracks" to me look more like 5-toothed gears. Edited by EnderDude, Mon Sep 3, 2018 12:36 PM. So, why didn't they use software sprites? Edited by EnderDude, Mon Sep 3, 2018 1:19 PM. Hardware sprites are easier to handle as you don't have to take care of redrawing the background and get to use the built-in collision detection. I'd appreciate a graphical upgrade, neither the buggy nor the aliens are real beauties. Should we remake the game from scratch, or should we use most of the original code to do this? All of the original mechanics, it’s fine,,,really. Did you actually ever play the arcade version ? I thought using the original code with software sprites would be harder to implement than starting from scratch, with the intention of also using software sprites. maybe simple hack would be to alter the sprite like it is at the moment ingame. EnderDude have you ever done software for the Atari? No, I've never done software for the Atari. Is it difficult to program software sprites? I've seen many games use interrupts of the 9 color registers to get several colors by changing the registers per scan line. Edited by EnderDude, Tue Sep 4, 2018 2:55 PM. No, I've never done software for the Atari. Is it difficult to program software sprites? No, it's similar to other platforms. Have you ever done software for any other platform? No, and I don't have the time to learn how to because... school. 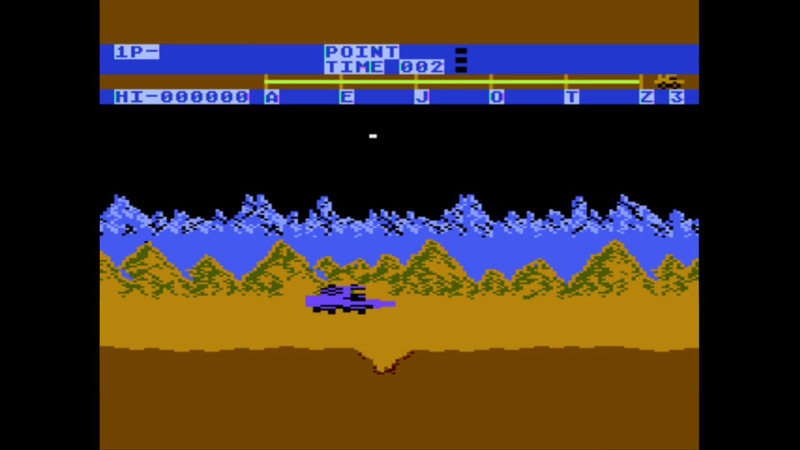 The game uses parallax scrolling. This will give you hard times to solve it with pure software sprites. Also, if you move objects vertically, you had to adjust the colors vertically, too. OK. If you manage to show a parallax scrolling, using the PM instead of background graphics, things get closer. Yes, there is a slight possibility to have better visuals in the game, without losing the great arcade feeling there. Edited by emkay, Tue Sep 4, 2018 3:14 PM. Okay. Looking at the area that the enemies fly in, they are also in these scan lines not using parallax scrolling, so they can still be software. The enemy missiles can be hardware pm's, just not so large. 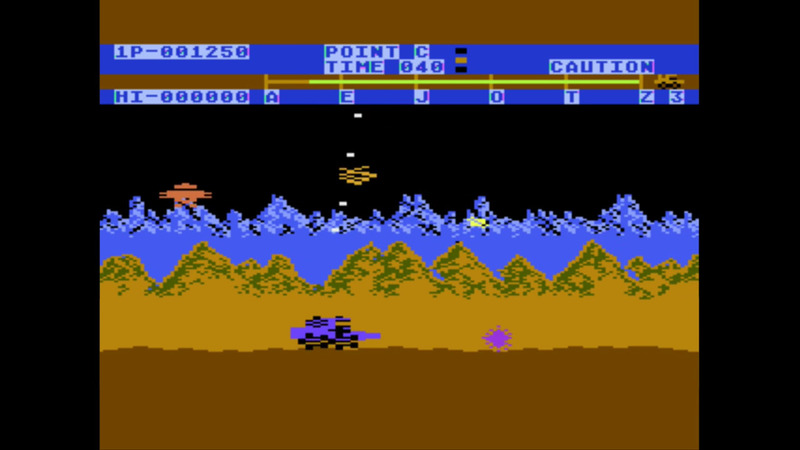 Player missiles going vertically can also be hardware, but the horizontal ones can be software, because of it being in that 16 scan line area on the bottom that doesn't use parallax scrolling. 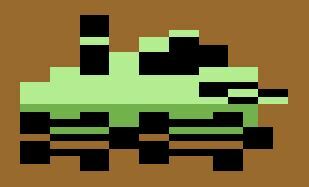 Can the wheels of the buggy still be software sprites, being in that non-changing area of 16 scan lines? For the uphill parts, that buggy has to use hardware pm's. Maybe the boulders can be software, since they're going down with the slope. Edited by EnderDude, Tue Sep 4, 2018 3:30 PM. To show this idea visually, I've outlined the pm's in green, and the software sprites in yellow. Don't the enemy sprites at some points overlap the mountains? My feeling is that if it's the case and ditto with the buggy then the job gets a whole lot harder. I checked, and the wheels at their peak DON'T overlap into the parallax area, and the aliens overlap the mountains only a tiny bit, so we can shorten their flying area a bit to compensate for that. Edited by EnderDude, Tue Sep 4, 2018 6:35 PM. 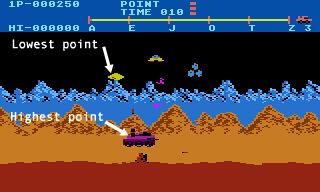 In fact, if you look at the space that the ships fly in, that empty space is a lot, and the peak of the jump of the buggy also keeps the wheels well within the 16 scan line area. Also, when the sprites are smaller, it makes everything less crowded. Hopefully, this whole thing isn't a pipe dream that it would be easy to accomplish. Edited by EnderDude, Wed Sep 5, 2018 1:18 PM. What I'm saying is that it isn't necessary for the enemies to overlap the mountains because they're smaller, giving the illusion that they have more freedom of movement. The hardest parts of almost any project is to actually start the work... and then to finally quit tinkering with it and put it out there as a finished project..